A police sergeant has been arrested after he was caught smoking Indian hemp at an event on Lagos Island. 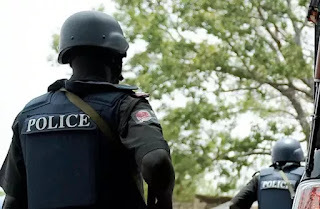 The sergeant, identified as Agu, also allegedly slapped the Divisional Police Officer in charge of Lion Building Police Division, Lagos State, who attempted to arrest him. It was gathered that a resident had alerted the Area Commander, Area A Command, ACP Sola Akinyede, aka Solebo, to the conduct of the policeman. The commander then directed the DPO to go and arrest Agu. But Agu went berserk and dared the officer and other policemen who attempted to arrest him. During the shouting match that ensued, Agu slapped the DPO but was eventually overpowered. A resident narrated the incident to Punch: “The sergeant was at the 155 anniversary of Epetedo. He smoked from the beginning of the party till the early hours of the next day. “He shot into the air. Somebody called the Area Commander, who sent the DPO to the area, together with some junior policemen. “He manhandled the DPO and slapped his face. A police team went to search his apartment at the police barracks on Beecroft Street, Lagos Island. They found Indian hemp in his house. “He was detained at the Lion Building Police Station. He was at the event on illegal duty. Agu is attached to the Nigeria Police Force Headquarters Annex, Kam Salem House, Obalende. Lagos State Police Public Relations Officer, ASP Olarinde Famous-Cole, confirmed Agu’s arrest. “The DPO got a complaint from members of the public that a policeman was causing disturbance at the event”, he said. “The DPO and some policemen went to the area and he was picked up. He was not caught smoking or found with any arm and there was no case of assault.